A lady promoting steamed dumplings on the street in front of Yurakucho station. In the busy period when 1926 was changing from the 15th year of the Taisho period to the first of Showa, Ginza Aster opened for business. With its interior and service championing a new American style, its best-selling dish was, of course, Chop Suey, the Chinese-style stew unique to Chinese American cuisine. 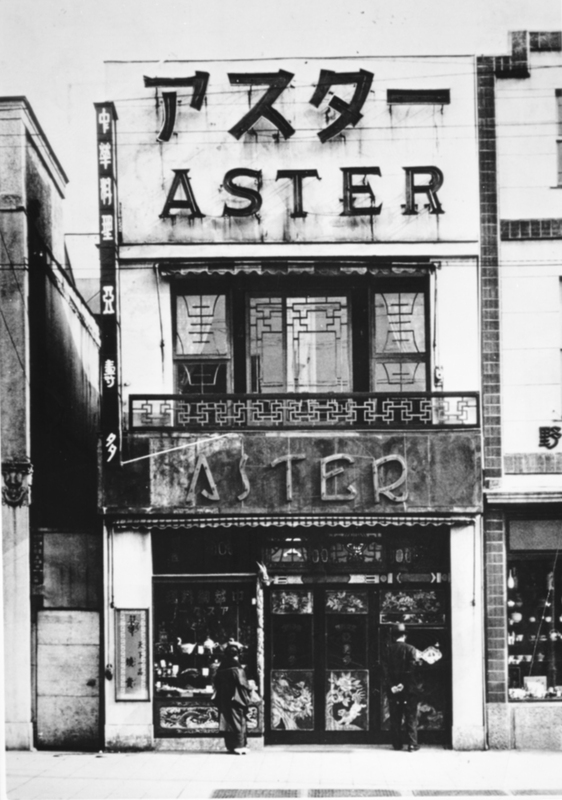 The name Aster was taken from the Astor House, an ultra-luxury hotel then located in Shanghai. This western sensibility was deeply connected to founder Yatani Hikoshichi's personal history. From the age of 20, Yatani worked as a purser aboard a cargo ship on the Hawaii - San Francisco route. After leaving the ship, he made a fresh start in milk delivery and eventually founded Yatani Butter, which at one time boasted a 60 percent share of all butter sales in Japan. Hikoichi Yatani, the founder of Ginza Aster. At age 38, using his wealth of experience and knowledge (exceptional for a Japanese person at that time), he embarked on the management of a new style of Chinese restaurant. It was a perfect restaurant for Ginza, a neighborhood always on the cutting edge of new trends, and it enjoyed huge success. It was so popular that when it became crowded, they would have to close the doors to customers and adopt a "one in, one out" policy. Its takings on New Year's Eve 1926 totaled 1,000 yen, at a time when a detached house could be built for 1500. According to Yatani's recollections, a Chinese person later advised him it would be better for the restaurant to have a more Chinese mood, and Yatani followed that advice dutifully. He began studying and made gradual changes to the restaurant, and before long, it was often mistaken for a Chinese-run establishment. The basis of today's top-quality Chinese restaurant was built right in the early days of its operation. During and after the war, the restaurant was plagued by a lack of supplies, but with the department store delicatessen boom that arrived in the early 1950s, the company struck out into a new field. Now, shoppers could pick up their favorite Ginza Aster dishes where they were already shopping for groceries. The first offering was shumai dumplings, which had been a hit since before the war, as well as manju buns, gyoza dumplings and many other products. Alongside these deli counters, the company opened up new branches of its restaurants. Fried gyoza, which Ginza Aster started selling in 1956, were particularly well received, to the extent production could not keep up with demand. To begin with, the gyoza, manju, shumai, etc. were made during the night at the main Ginza restaurant, but to respond to demand, new factories were built in Tsukiji and Harajuku. Aster-chan, the image character of Ginza Aster, who wears traditional Chinese dress. The intense schedule took a toll on Yatani, who collapsed from overwork and was near death by New Year's Day 1957. Around this time, food delivery vans with "Aster Shumai" written in large letters on the sides made their debut on the streets of Tokyo. 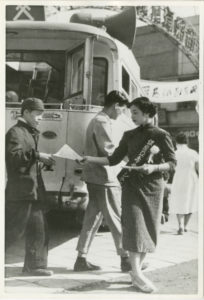 The need for advertising and promotion had been recognized early on, but in 1959, Ota Kikuko, the founder's daughter (then 28 years old) took charge of the publicity department, spurring it on further. Out of that, the cheongsam dress-wearing mascot Aster-chan was born, and became especially popular among girls. In 1961, the company aired its first TV commercial during the popular series Lassie, with a unique advertising jingle. The idea of broadening the corporate image to include children was a great success. 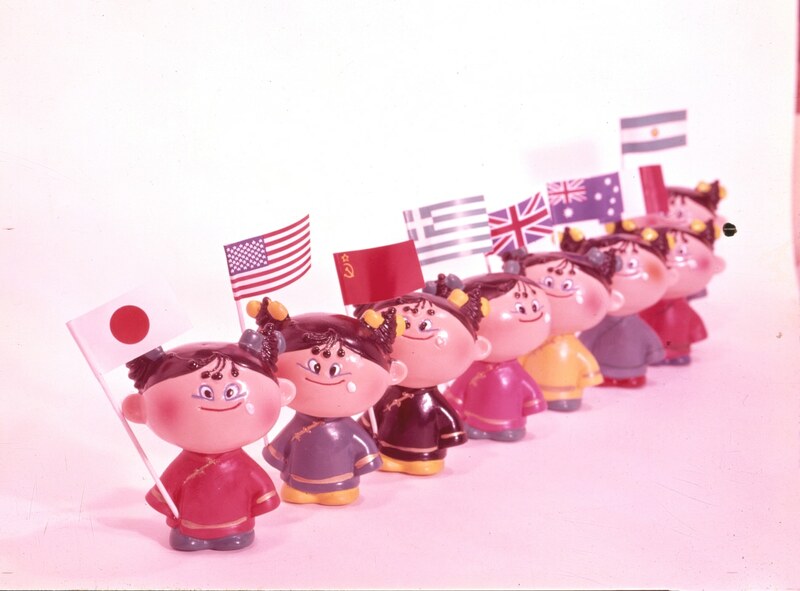 By the mid 1960s, the Ginza Aster name became widely known. In June 1967, the company founder Yatani Hikoshichi passed away, marking the end of a whirlwind period for Ginza Aster. Previously, Chinese restaurants tended to be small places offering food à la carte, so when Ginza Aster opened a dinner restaurant equipped with a banquet hall at the Hotel Hanshin in 1967, followed in 1968 by the 550-square meter Nihonbashi branch that could seat 100 diners, it was considered very outlandish. Especially after 1971, when Ota Yoshio became company president, Ginza Aster began to push for 1,000-square meter restaurants. Huge dining spaces began to appear, such as the Shinjuku branch, with 1,500 square meters of floor space spread over two levels. At the time, Japan was experiencing a period of high economic growth, and this was reflected in the accelerating increase in large-scale corporate requests. Large-scale restaurants were in line with this trend. As the size of the restaurants grew, the number of personnel also increased, and it became necessary for Ginza Aster to transition to more modern forms of management. As part of this transition, in 1973, the company concentrated its operations at a head office in Gotanda. While the organizational change and systematization required to develop as a company was proceeding on one hand, on the other, the need to pursue even greater customer satisfaction was also made clear. The start of the project known as CCIVSS (Chinese Cooking Information Value Service System) in the same year was part of this mission. This was a management technique that used the power of organization to offer high-quality Chinese cuisine worthy of the name. In the past, the founder Yatani Hikoshichi had said, "there is a slightly unconventional side to me, in that profit is the second objective of my business, and the first is having people tell me the food is delicious. For example, even the shumai, I want to try my best to surprise the customer, to hear them say it's delicious, to stun them, even." CCIVSS is an attempt to continue this way of thinking, to develop it and to apply it to the lives of modern people. 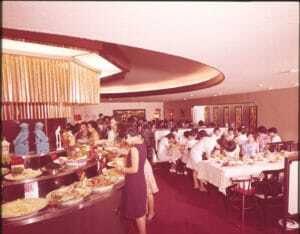 Tasting Manchu Han Imperial Feast for research at Hong Kong Da Tong restaurant (1973). What company president Ota called for was to thoroughly absorb Chinese food culture. 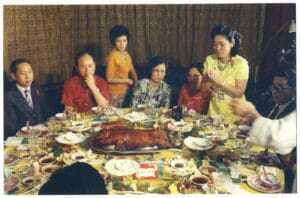 Already in 1964, eight years before the normalization of Sino-Japanese relations, Ota Kikuko had accompanied food researchers to China, but after normalization, one after another, the cooking staff began visiting China to experience the food at its source. In May 1973, a group of top chefs from Hong Kong attempted to reenact the Manchu Han Imperial Feast, so the head chef from the Ginza branch and others traveled there to sample and record every dish over the course of three days and nights. Ota said over and over again "we must study China harder than the Chinese chefs themselves. Learn Chinese history and culture even more thoroughly than the Chinese. Only then will we be able to stand alongside them." 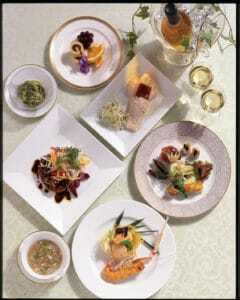 Moreover, he said, "Study authentic cuisine and acquire the skills to make it. When you know what authentic cuisine is, then you can go back to basics. Only after that you can start to think about how to modernize it." He exhorted the staff, which by then had already surpassed 1,000 people, to take the time to diligently and persistently seek out the authentic. Even president Ota himself often made trips to China. Encouraged to "walk to every part of China and see what you find," the results of the employees' China trips are best illustrated by Ginza Aster's popular "Chen Mapo Tofu." In 1980, a party from Ginza Aster entered the capital of Sichuan province, Chengdu, for the first time. That town is well known as the hometown of Mapo Tofu. The party visited many restaurants, eating Mapo Tofu at each one. However, none of them satisfied. When they asked, they were told there was an original "Chen Mapo Tofu" restaurant, but that it was forbidden to take foreigners there. This was still before China had opened up to the world. The party didn't give up, however, and after negotiating tenaciously, they were finally able to visit the restaurant and sample the dish. It was a totally different taste from anything they had experienced before. It was two years later that Chen Mapo Tofu, whose birthplace the party had struggled so hard to reach, made its appearance on Ginza Aster's menu. However, the original recipe was too spicy for typical Japanese tastes, and was thought to be quite expensive, so at first it had difficulty finding acceptance. Gradually, however, it began to make headway, and is now one of the company’s specialty products. Each and every dish at today's Ginza Aster has been developed and refined in the same way, with repeated visits to their Chinese places of origin. As an event to introduce customers to all the dishes the staff have sought out from each part of China, we have the meisaiseki. Since the first Beijing meisaiseki was held in 1977, it has been held regularly for almost a quarter century, on 273 occasions as of October 2001. The menu uses seasonal ingredients extravagantly, so the menu is finalized only a month before the event itself. Two weeks before a meisaiseki, a rehearsal and tasting event is held. In this way, the authentic taste of the dishes can be thoroughly understood before each is finished up with a Ginza Aster flavor. For every dish, we pursue a balance between unchanging tradition and ever-changing trends. This immutable principle continues to form the backbone of Ginza Aster today. 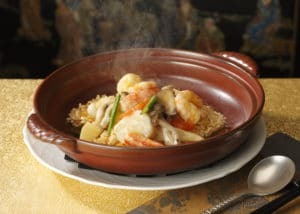 Sizzling rice with four kinds of seafood. In 1992, the renovated flagship restaurant in Ginza opened its doors. This is the place where it all started. The new restaurant was developed as a starting point for the continued evolution of the company. All aspects of the restaurant, from the interior design to the products and services, were tackled from a completely new perspective. Ginza Aster has a wealth of experiences and achievements, built up over long years studying food and traveling to all parts of China. At the new flagship store in Ginza, a neighborhood which is always producing new items of the highest quality, we aim, together with our customers, to realize the "all Chinese" philosophy that we have taken from these experiences as fresh, contemporary cuisine. This effort continues to be realized in various forms under the banner of "Chinese Meisai." The "Tao Cai" course, offered since 1989, is based on this way of thinking and now a staple of "Ginza New Chinese Cuisine," which is attracting attention as a lifestyle choice that is always a half step ahead. This meal course is a response to contemporary life, full of variety and served a little at a time, for groups of two or more. Using plenty of vegetables, the dishes are also tailored to the needs of a health-conscious age. It's a pioneer in world cuisine, gentle to both people and things. Tao cai (photo is for illustrative purposes). In 1996, after 20 years of continued communication and exchange, Ginza Aster officially formed a relationship of friendship with the Guangzhou Jiu Jia. Hence a long-established restaurant in Guangzhou, joined hands with a Chinese restaurant in Ginza open for more than 75 years. Two years later, staff from Guangzhou Jiu Jia visited Japan, and a meisaiseki was held to introduce their unique dishes. The globalization of food has finally started to become reality. Ginza Aster, which has explored the vast world of Chinese cuisine over the years, is trying to become a place where the world's cuisines can meet. Ota Yoshio, who has been investigating what it means to serve Chinese food for Japanese people, explains it as follows: "We hope that people can derive intellectual satisfaction through food. Obviously, food must be delicious, but when people know the origin and provenance of the ingredients, their level of satisfaction increases dramatically. So, what I want to include in our food now is information. Thus for the first time, eating becomes a human act." In this way, food is really becoming culture.